It’s not a four-letter word, but you might think it is, by the reactions it invokes. The symptoms aren’t all that charming either: Mood swings. Hot Flashes. Night Sweats. Headaches. Weight gain. Some will argue that the only good fact about menopause is that it’s not actually a disease. It just feels like one. 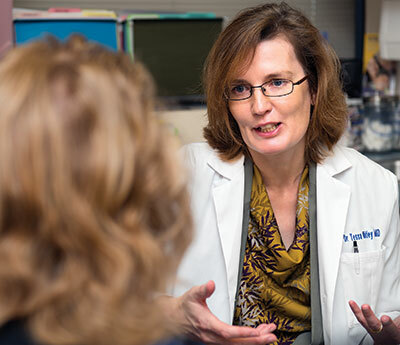 And it’s only temporary, assures Dr. Teresa Whitley, an internist in the NorthBay Center for Women’s Health, who has made it her mission to help women through that tricky time in life when their body is in transition. It’s all about hormones, she explains. And hormones aren’t bad things. Our bodies need them. But there comes a time in a woman’s life—usually between the ages of 45 and 55—when some hormones are starting to dissipate. That can lead to all sorts of issues, from mood swings to migraines. And that’s why hormone replacement therapy was all the rage in the 1980s. But a study that came out in 2002 showed that estrogen supplement treatment had its own string of repercussions, including an increased risk of stroke, heart attack, blood clots and colorectal cancer. Black cohosh, an herb, can help with hot flashes and night sweats. Melatonin, an over-the-counter supplement, can help with sleep disturbances. Anti-depressants can help with night flashes and hot sweats. A contraceptive pill can diminish some symptoms, because it provides a high dose of estrogen. Patch therapy is another way for a woman to receive a lower dose of synthetic hormone. See your doctor before embarking on any of these solutions, says Dr. Whitley. There’s some good news: Menopause usually doesn’t last more than five years. And there’s a blood test women can take to determine if they are post-menopausal. Dr. Whitley’s best advice for weathering the change is actually pretty good advice for anyone, whether they’re combatting menopause or not: Eat right, exercise, sleep well and avoid stress. And remember: This too shall pass. For more information about meno-pause, symptoms, treatments and more, visit www.menopause.org.